Its another beautiful sunny day today. Not too hot, just nice. I'm sure its gonna be scorching hot from 2pm onwards. Don't really like it bcos I usually cook dinner at abt 4.30pm, can imagine how hot and sweaty it will be slaving in front of the stove. Not complaining in fact, alhamdullilah, thank God, with this beautiful sunshine weather, my washing gets dry in no time. Only thing is that I still have that laundry basket filled with clean clothes from my previous washing which are still pending, to be folded and ironed....huhuhu. Adapted from Rachel Ray's 30 Minute Meals with a few amendments by me towards the original recipe. - Boil potatoes in salted water until tender, about 12 minutes. Drain potatoes and pour them into a bowl. Add butter and milk into potatoes and mash until potatoes are almost smooth. - While potatoes boil, preheat a large skillet over medium high heat. Add oil to hot pan with beef or lamb. Season meat with salt and pepper. - Brown and crumble meat for 3 or 4 minutes. If you are using lamb and the pan is fatty, spoon away some of the drippings. - Add mixed veggies, garlic and onion to the meat. Cook veggies with meat 5 minutes, stirring frequently. - In a second small skillet over medium heat cook butter and flour together 2 minutes. - Whisk in broth and add Worcestershire Sauce. Thicken gravy 1 minute. Add gravy to meat and vegetables. - Preheat broiler to high. Fill a small rectangular casserole with meat and vegetable mixture. - Spoon potatoes over meat evenly. Top potatoes with paprika and broil 6 to 8 inches from the heat until potatoes are evenly browned. Top casserole dish with chopped parsley and serve . 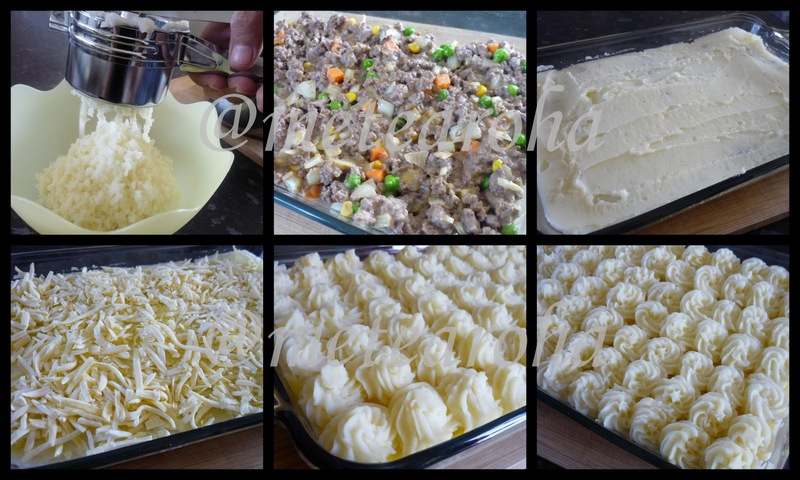 Fill the baking dish with the cooked minced meat. I used a 2 litre baking dish. Spoon half of the mashed potatoes on top of the meat. Piped the rest of the mashed potato on top of the cheese or you can just spoon the rest of the mashed potato on top of the cheese. Bake in a 190-200 degrees fan forced oven for 15 minutes or until cheese melts. Masyaallah cantiknya potato tu macam awan putih berkefol2 Anie oii!! I ada dalam simpanan potato ricer tu tapi dia duk megun dlm cabinet tu aje..
Aduuhhh semakin berkembang I biler baca ur compliments...weeeiiiii tenkiu hehehez. Babe, selamat mencuba resipi ni insyaAllah menjadi dan confirm sodap menjilat jari...hehehez. cantik sangat sayang nak makan... n rasa pasti sedap with all the pelakun tambahan tuh! amboi rajin nyer u pipe the mashed potato cik adik oiii :P.
u know me lar, as usual, i guna short cut ajer hehhee. 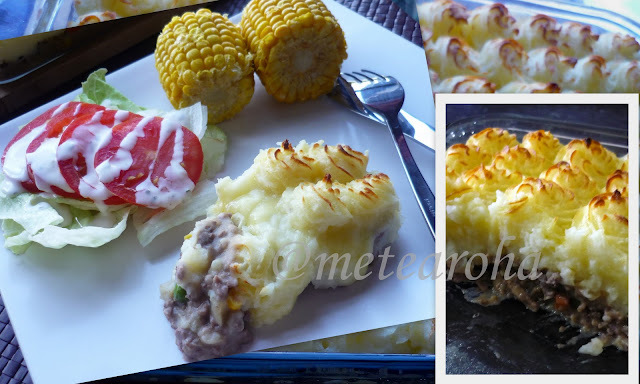 i'd just spread the mashed potato onto the minced meat. Tenkiu babe, sbb sudi share recipe ;) next time I nak try u punya style pulak. Alah babe cian u sakit, dah mkn obat ke tidak ni? Mcm mana u ni boleh terkempunan? Sakit2 pun masih ada selera nak makan...hehehez. Anie.. dah berapa lama u tak balik Sg? Try lah this recipe, mmg sedap ;) highly recommended, kalau u nak ikut original recipe but ok gak. Mmg kena betul dgn tekak kita dkt sini. Hi kak, hari tu I buat SP ni si Jannah pun actually dah tak sabar...hahahaz. Dia colet2 kentang yg sy dah piped....haiizzz ini anak. masyaAllahhh td br terliur tgk kat tv sherperd pie nih! pk esok nk buat... lg bertambah2 terliur aku peahhhhhh! huh! hehehez ;) we really enjoyed this SP, harap2 u pun suka gak lah biler dah buat nanti ahaakkzzz.